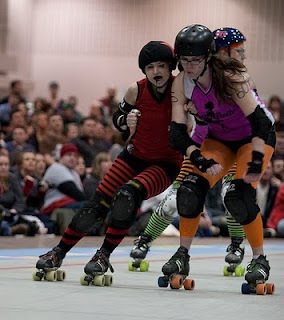 Saturday marked what we knew, would be one of our toughest bouts of the season. 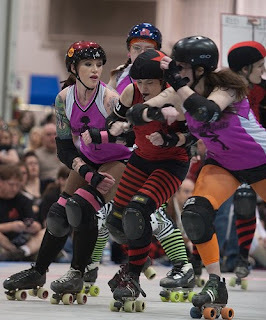 Sin Lizzie had to retire due to injury, Touretta Lynn had to retired due to injury, so we went into this bout down two of our best blockers, with some fresh meat on our roster. We played Sioux Falls previously and lost, on their home court. In our defense, it was the beginning of the season, and lots of Sirens couldn't make the trip (myself included). Saturday morning I awoke and began having one of my worst bout days ever. I felt like crap, the shop was SLAMMED beyond anything I have ever seen, which is awesome, but it meant I stayed about two hours longer than I wanted to. It felt like I was forgetting everything when I went to the fairgrounds. My helmet, my wheels, new bearings, etc. So I practiced on my G-Rod wheels, which are way to grippy for that court, and with Touretta Lynn's helmet. Dill brought me my helmet and wheels, only for me to find out that I bought the wrong sized bearings. Argh! I took about five minutes in the corner to close my eyes, breath deeply, and shake everything off. The bout was sold out, the crowd was already getting loud and I'll be dead honest, I was nervous. 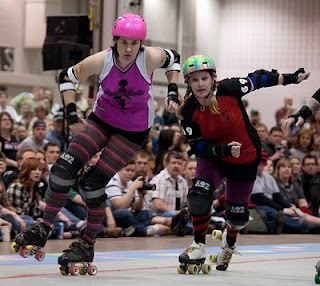 Sioux Falls looked really together, they had some big girls, and they all looked solid in their skates. The first jam, we put our brand new Siren Booche in. She fouled out almost immediately, allowing the Sioux Falls jammer to put some points on the board. Next jam I was in the pack, and while we made some contact with their jammer, again, they got on the board unopposed by our jammer. Pretty soon the score had crept up to 20something against 40something, in favor of Sioux Falls. They were doing a great job of holding three strong in the front, and keeping within 20 feet of our girls. The pack was pretty quick for the most part, then something clicked. They started attempting to slow the pack down, and we started using that to bust up their blockers. 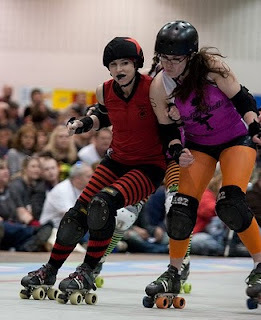 Maiden America went on the line as our jammer, and Sioux Falls jammer fouled out. Maiden used the slow pack, and the holes that were opening up, to put 28 (!!!!) points on the board for us. Taking us from a deficit to a 3 point lead! We held to our lead the rest of the night. Again and again in the second half they were trying to run a slower pack. By the last 10 minutes they were simply trying to run the clock down by not moving when the whistle blew, trying to get their blockers in penalty on the track and into the action quicker. I think that this was a bad move on their part. I understand wanting to get your blockers out, but running the clock down when you're behind didn't seem to be the best move. We won by a mere 11 points, proving that this team seriously brought their A game against us. It was a tough bout, and I would love to play them again. A great game on the track, and a great game for our fans. After party was wonderful, and Sioux Falls owned the dance floor the whole night. Very cool girls. THIS JAMMER! Holy Crap! Julia Wild. Absolutely incredible. They jammed her over and over again. I think her and Queen Elizabitch were their two best that could just bust through us every single time. We would move in for a hit, and unless we were set up with a two person block they would be long gone before we could make contact. 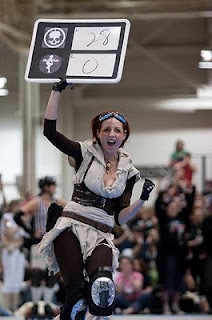 Did I mention it was a Star Wars themed bout??? 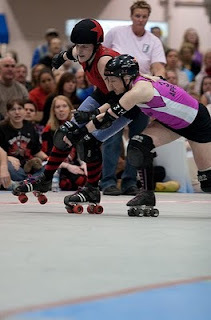 Poor Slammy's hand got caught by this blocker! Celebrating Maiden's 28 point jam! Jr. Derby was the half time. It's seriously the cutest thing in the world. 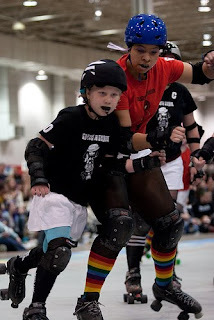 The girl in black is the daughter of one of our skaters, and I swear they make the same face when they skate!!!! Touretta had to retire!?! What?!! Whose daughter? Can I ask? I think NRG and SFRD are NSRG's two favorite teams to play and party with! NSRG is going to play SFRD for the third time, and while I have not been able to go either time, I hear their after parties are epic and that they are really nice girls. Stalker you will have a blast! And even though I loved Sioux Falls, you know I'll be rooting for NSRG all the way!!!! This was one of the most exciting NRG bouts this season!